From the time you graduate college, and possibly even before then, you spend the majority of your days going to work. Day in and day out you most likely work hard and put your all into your job. Ergo, after so long, you might just muster up the courage to ask your boss for a pay raise. If you do, there’s nothing quite as satisfying as being granted one. After all, while money isn’t everything, life doesn’t necessarily come cheap. So, having a little extra cushion is always welcome. Nonetheless, while that extra income might allot you more chances to spend your money on something fun, you should still take the opportunity to use that extra income in a way that benefits your finances for the long-term. If you’ve recently received a pay raise or are in line for one, take a look at these six smart ways to use it. Debt, even if acquired for the right reasons, is one financial aspect you don’t want to hang over your head. What might seem like free money at the time, accumulates hefty interest in no time. This only prevents your ability to put away money for savings and retirement. If you have the luxury of getting a pay raise, there’s no better use for that extra income than to use it to pay off debt. Before saving, investing, or even treating yourself, take the surplus from your paycheck and work to dig yourself out of the whole. You’ll keep yourself from accruing extra interest and put yourself on a good financial path. One of the key ways to keep moving forward with your career and life is by constantly striving to better yourself. Whether that’s through furthering your education or simply learning new skills and tasks, anytime you make a goal to invest in yourself, you only make yourself more valuable all-around. 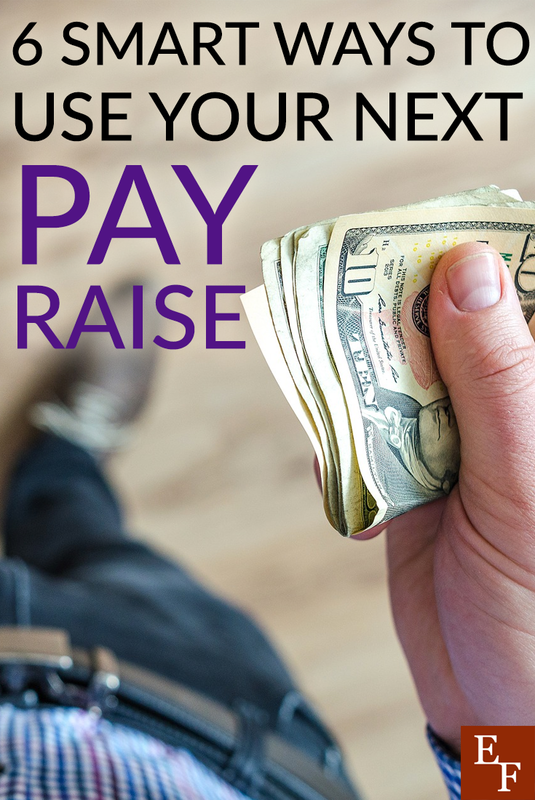 By using your pay raise to pay for schooling, classes, or even books to teach yourself, you’ll set yourself up to not only stand out in your job, company, career, but to stand out come time for another promotion or raise. Whether you’re hoping to purchase a home, buy a car, or begin a college fund, your short and long-term goals are a major financial priority for you. Unfortunately, depending on your paycheck and expenses, the amount you put each month towards those goals doesn’t always feel like enough. You might begin to think that it’ll take forever to accomplish them. Hence, if a raise has come your way, you have a prime opportunity to reexamine your budget and add a little more to those financial goals. Retirement has a tendency to feel like it’s lightyears away. And although it might not be on your immediate horizon, the sooner you start saving, the longer your money has to build. Plus you’ll be better off in the future. Like your financial goals, the percentage of each paycheck contributed to your retirement fund can feel too meager to mean much. While every little bit counts and will no doubt accrue interest over time, any additional contributions you can make to your retirement fund only serves to benefit you in the long-run. Calculate your end-retirement income goal, figure out exactly what you need to save, and see if you can use your jump in monthly income to up your retirement contributions. The financially savvy and every financial advice piece out there emphasizes the utmost importance of having a solid emergency fund. Life has a way of taking us by surprise, from medical emergences to car accidents and home repairs, we never know when disaster will hit or just how much it might cost. In the event that you’re in the need for emergency cash, you don’t want to have to dip into valuable savings or retirement funds and taking on debt is less than ideal. Instead, put some of your new income towards building up a specific fund just for emergencies. Work towards saving up six-months worth of your salary, and you won’t have to worry come the unexpected. If you own your home, one of the best financial moves you can make is to build up equity into that home. Come the time you’d like to sell, valuable additions, updates, and repairs can greatly increase your home’s value. Take a look around your house and see what projects you could invest in that would add value. Although you might need to save some of your newfound income for awhile before officially going into construction mode, doing so can be a smart way to use your new pay raise. Receiving a pay raise is a wonderful thing. Usually, it’s the result of months and years of hard work on your part, which is why there’s nothing quite as rewarding. For many, a pay raise is an opportunity to have a little more breathing room and comfort in their paycheck. After all, even if you don’t live paycheck to paycheck, life is expensive and between your expenses and the unexpected, having extra cushion in your salary is never a bad thing. That being said, just because you’ve had an increase in pay doesn’t mean you should go on a spending spree or blow your newly acquired money simply on things you want. Instead, do your best to make the most of the increase. Get your finances in order and set yourself on the right path; pay off debt and make point to contribute to your savings and retirement. While you might feel the impact in your immediate life, come retirement or months to years down the road, you’ll be glad you invested your pay raise wisely by investing in your future. Has your pay raise enabled you to contribute more to your savings and retirement? Did your pay increase provide you with a solid cushion?